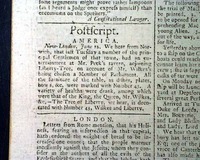 THE LONDON CHRONICLE, England, Aug. 16, 1768 The back page has a small article headed: "America" with a New London dateline noting: "...a number of the principal gentlemen of that town had entertainment at Mr. Peck's tavern, adjoining Liberty Tree, on account of Mr. Wilkes's being chosen a member of Parliament..." (see). 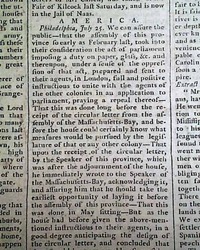 The first half of the newspaper is taken up with the continuation of the "Narrative of the Hon. 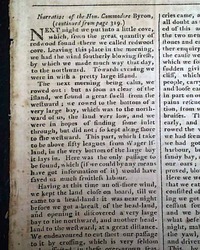 Commodore Byron" on his expedition around the world in the 1740's.